Iowa.Who Needs a Commercial Drivers License? Drivers of big rigs, school buses, passenger buses and other large commercial motor vehicles must obtain a commercial driver’s license. The Iowa Department of Transportation Bureau of Motor Vehicles (BMV) issues CDL licenses to Iowa drivers. Applicants must first take and pass a knowledge test to get an Iowa CDL permit. After getting the permit, a driver must then get training to take a hands-on skills test. Those who pass the skills (and driving) exam can then get an Iowa CDL license from the BMV. Access the “Model Commercial Driver License Manual” at the Iowa Department of Transportation website. Use this Iowa CDL manual to prepare for the CDL knowledge exam. Study the portions of the exam that are relevant to the type of vehicle you plan on operating in Iowa. For example, if you want to be a truck driver on a truck with air brakes, you need to take the Air Brakes endorsement test. An endorsement is a special designation on your CDL license that allows you to operate certain vehicles or cargo, such as passenger vehicles, hazardous materials, air brakes and school buses.Study the entire CDL manual if you are not sure about your commercial-driving career plans. This will maximize your options for the skills portion of the exam and your employment opportunities. Take the knowledge test at your local Iowa BMV. You must pass this test and then get an Iowa CDL permit. A learner’s permit allows drivers to operate commercial vehicles while supervised by a licensed Iowa truck driver or other CDL driver. Complete your Iowa CDL training. Opportunities for training include, among other things, school bus training with local Iowa school districts, passenger-bus training with private transportation companies and truck driving schools. The Professional Truck Driver Institute certifies some Iowa truck driver training programs. 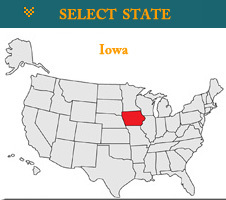 Access the list of truck driving schools in Iowa with certified programs at Ptdi.org/schools/schoolslist.aspx#iowa. Contact other employers directly for CDL training opportunities. Complete your training. You will then need to take a hands-on skills test that includes driving on the road. You must provide a vehicle for testing purposes. Generally, you can arrange for a vehicle and testing through a truck driving school or employer. Otherwise, you may need to rent a truck or other commercial vehicle from a CDL rental agency.